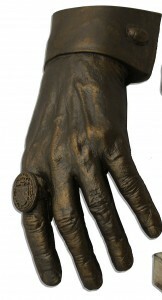 (1) Forry Ackerman’s hand went unsold in the Bradbury auction. Well, not his actual hand, a sculpture of it. Presumably nobody realized that’s what it is or there might have been takers. John King Tarpinian recognized the “large ring” is Ackerman’s famous Dracula ring – originally worn by John Carradine in Universal’s House of Frankenstein (1944) and House of Dracula (1945), then by Bela Lugosi in Abbott and Costello Meet Frankenstein (1948). Ackerman and Bradbury were friends for many decades, so if there was reason to make castings or sculptures of Ackerman’s hand then there might be an equally good reason why Bradbury owned one. Perhaps someday we’ll find out. (2) Disney will remake Something Wicked This Way Comes, originally produced in 1983 from a script written by Ray Bradbury himself. (3) The Lake County News-Sun’s editorial writer, a red hot Bradbury fan, grows increasingly grumpy as it appears that the author’s home town of Waukegan is about to snub Bradbury again by declining to name a school in his honor. The School Board’s current argument against honoring the world-revered author is that he moved away from Waukegan. That’s what often happens. It’s not a punishable offense. When the board considered renaming Whittier School, the same argument against Bradbury was offered although it did not stop a previous board from naming a middle school after Jack Benny, another hometown product who left. But Bradbury so truly loved growing up in Waukegan that reflections of his youth and the town he revered reverberate through his books. People everywhere in the world know about Waukegan because they know Bradbury…. For the record, Samuel Langhorne Clemens moved away from Hannibal, Mo., when he was 17. But Hannibal never had any trouble finding suitable ways to honor him. Townsfolk named a school for him. They knew being Mark Twain’s hometown was their honor, even more than his. (4) Something else Mark Twain and Ray Bradbury have in common is they both have books on Edina, MN’s 7th and 8th Grade Reading List – The Adventures of Tom Sawyer and Fahrenheit 451 – though the blogger who pointed this out feels theirs are the only two works on the current list that deliver the same challenge and literary value as the books on Minnesota’s 7th and 8th Grade Reading List in 1908. 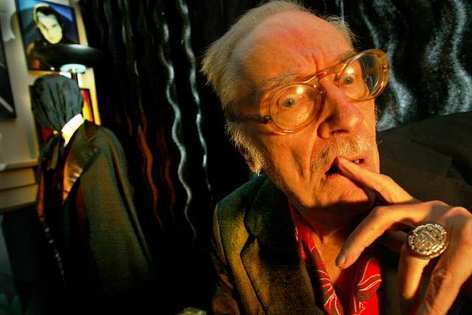 This entry was posted in Heard Online and tagged Forrest J Ackerman, Mark Twain, Ray Bradbury by Mike Glyer. Bookmark the permalink. I’ll be there wearing my duplicate of the 4E/Dracula ring. Someone else would have to say how they feel about KV in his birthplace of Indianapolis, IN. 4E’s hand has been bought. Probably thanks to File770.